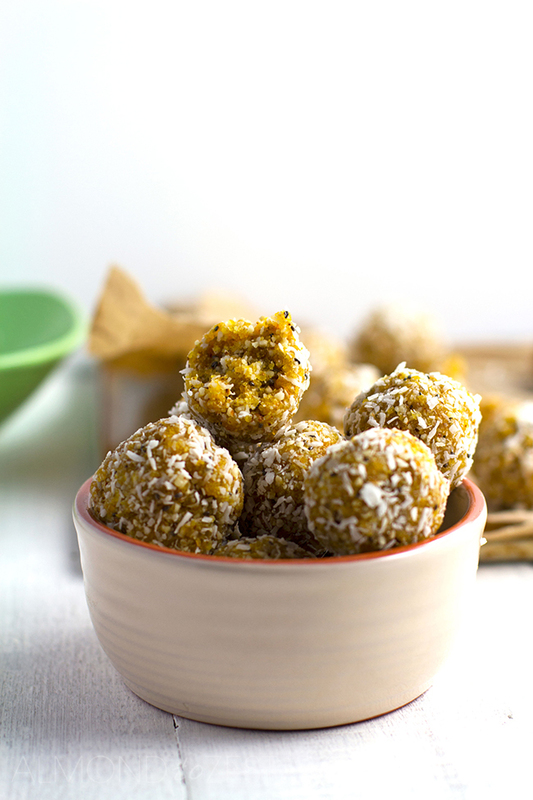 Dried apricot, coconut and chia seeds all come together to create these irresistible little bliss balls that you are guaranteed to love. It’s coming up to that time of the year where I have to start thinking about packing away the winter bod. And by that I mean getting rid of all those extra layers that seem to accumulate on my body in the cooler months. So to start the layer shredding off, I decided to get a bit more exercise into my life and start making some healthier snacks to munch on during the day. Lately the only kinda exercise that I have been doing is walking the dogs. And even that has not been that consistent due to an overly wet season that we have been experiencing down here in NZ. And I don’t know about you, but whenever the colder days start to arrive, and the days get shorter and shorter, and the nights get longer and longer, I get lazier and lazier. And regular exercise seems to take a holiday in my life. But this week I decided to try to get back into a routine, by doing what I thought was an easyish type of workout. Oh but how wrong I was about the easyish part. As soon as I started I could feel how unfit I had become, and in no time I was struggling to complete sets without taking a ‘quick’ break in between. By the end of the session I was exhausted, but was feeling amazing. I love how exercise does this to you. But when I woke up the next day, I felt less than amazing. My whole body ached with pain, which continued for many days, as I struggled to do even the most basic things like walking and squatting down. I don’t love how exercise does this too you. 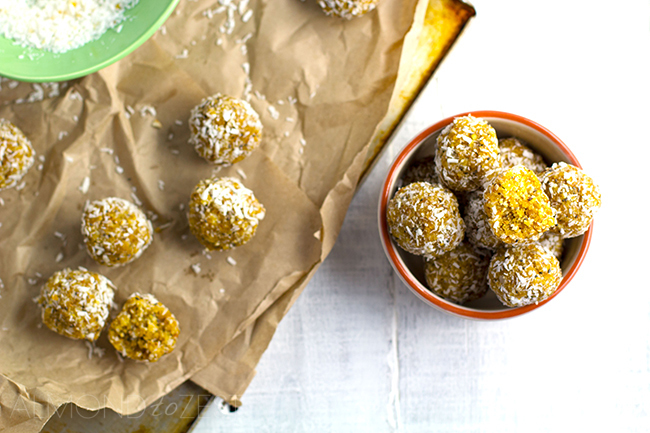 Thank god I had a batch of these little apricot, coconut and chia seed bliss balls to bring a bit of sunshine into my life, otherwise I’m not sure if I could have possibly coped. 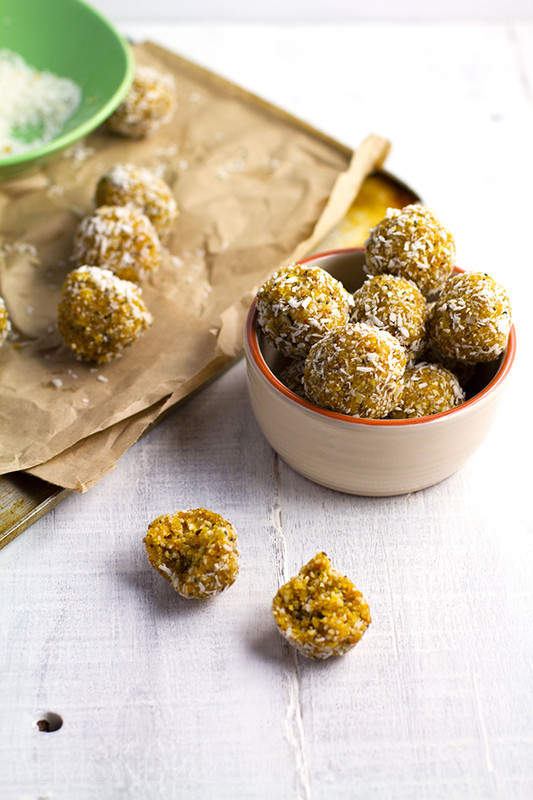 These healthy little apricot, coconut and chai seed bliss balls are a jazzed up and modernised version of one of my all time favourite childhood treats. When I was young I always remember getting so excited when my Mum would give me an Apricot and Coconut bar from the brand Europe, which are probably best known for their Summer Rolls and Honey Nougat Rolls. I loved this bar for two reasons, first was for the tangy sweet flavor and second was the chewy and crunchy texture. Which is why I decided to recreate my own version, but in the form of a bliss ball instead. So in my recreation I have added a few more ingredients. The first two being raw almonds and sunflower seeds. These guys, added with the coconut are what form the dry part of the bliss balls. They give the balls a crunchy yet crumbly texture. Oh and of course an added depth in flavor. The third ingredient is the ever flash and popular chia seeds. These guys give a real poppy kinda crunch to the bliss balls. Plus I love how they get all jellied up if they get caught in your teeth. Kinda like an after meal treat. And last is the coconut oil. Depending on what type of coconut oil you use, it can add a hint of extra coconut flavor and help bind the ball together once chilled. All these fabulous ingredients get blitzed up with the star of the show, the dried apricots. These help bind everything together and give the main tangy sweet flavor to the bliss balls. And don’t you just love how quick and easy making bliss balls are? Just simply blitz the ingredients up in your food processor for a few minutes, roll them into balls and chill in the refrigerator. Too easy right? And don’t worry if the mixture looks too crumbly once blitzed, they will stick together once squeezed and rolled. And once chilled they will hold together nicely from the coconut oil. 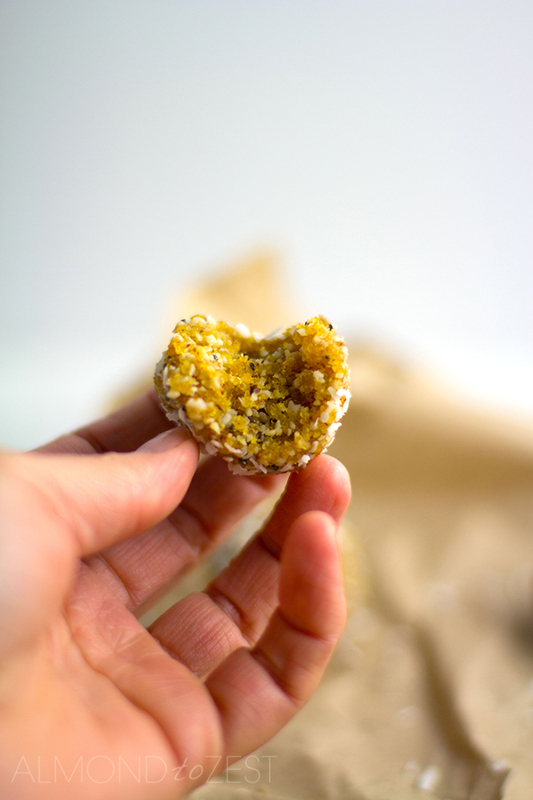 I know you guys are going to love these no-bake apricot, coconut and chia seed bliss balls cause they are super delicious and healthy. Plus they are just too damn easy to make. They are naturally dairy free, gluten free, grain free and are suitable for both vegetarians and vegans. And they make the perfect daytime snack, post workout snack, running out the door breakfast and make a great healthy after dinner treat. Oh yeah and they have magical powers to fight away over exercised aches and pains. If you guys try these bliss balls and love them, then you may like to try my MUM’S ENERGY BALL BITES. And if you do I would so love to hear about it!! Please leave your comments in the box below. 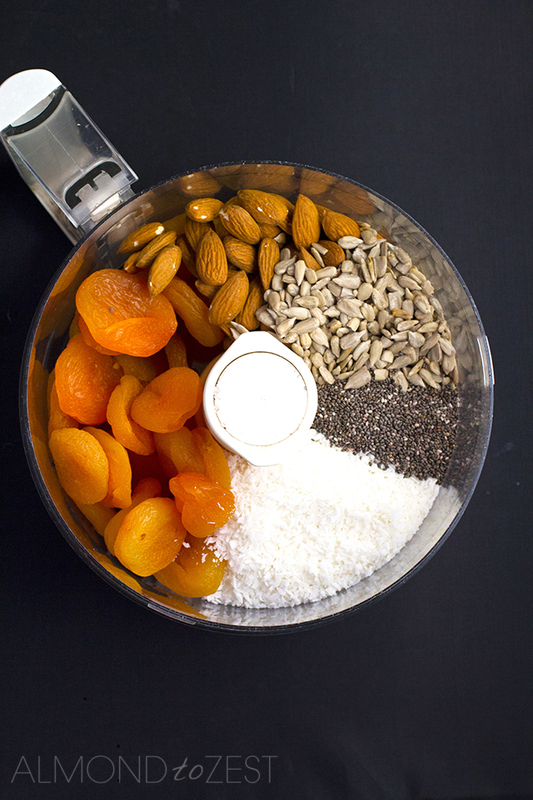 Place apricots, almonds, sunflower seeds, coconut and chia seeds into food processor. Blitz for a minute. Place coconut oil into food processor and blitz for 2-3 minutes. Don't worry if mixture still looks a bit crumbly. To make the balls scope out a heaped teaspoon of mixture into hands, lightly squeeze mixture to help it stick together, then roll into ball shape. Roll balls in coconut. Place on tray or plate. Once all balls are rolled place tray or plate into fridge for at least an hour. Then transfer balls into airtight container and keep in the refrigerator. Balls should last for 2-3 weeks.